A standard Polymerase Chain Reaction (PCR) is an in vitro method that allows a single, short region of a DNA molecule (single gene perhaps) to be copied multiple times by Taq Polymerase. From a single copy of DNA (the template), a researcher can create thousands of identical copies using a simple set of reagents and a basic heating and cooling (denaturing and annealing) cycle. The process became automated with the discovery of a heat resistant DNA polymerase from the thermophilic bacterium, Thermus aquaticus (Taq) . Taq polymerase can withstand many heating and cooling cycles, which would denature DNA polymerases from other species. In addition to the template DNA and the Taq polymerase, PCR requires free nucleotides [dNTPs; adenine (A), cytosine (C), guanine (G), thymine (T)] in an equal molar ratio. It also requires two unique single stranded DNA oligonucleotide (oligo) primers, which anneal to the regions upstream (5’) and downstream (3’) of the DNA segment to be amplified. When these reagents are combined in an appropriate buffer, a series of heating (denaturing) and cooling (annealing) steps allow the Taq polymerase to copy the DNA in between the oligo primers. This molecular biology technique creates several micrograms of target DNA from just a few nanograms of template DNA through several cycles of denaturation, annealing, and synthesis. After the PCR is complete, the product can be verified based on size by gel electrophoresis . Initial Denaturation for 2 minutes at 94°C: This initiation step heats the double stranded DNA template strand to the point where the strands start denaturing and the hydrogen bonds are broken between the nucleotide base pairs. Denature 30 seconds at 94°C: Continued denaturation of double stranded DNA. 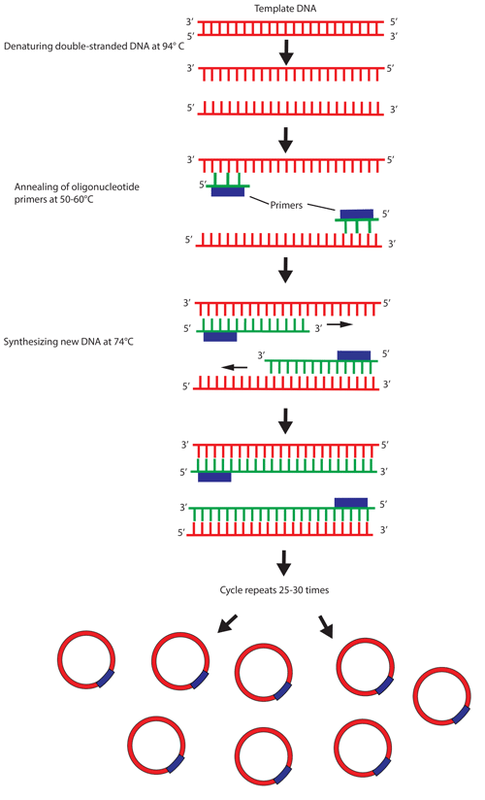 Anneal primers for 30 seconds at 55°C: The forward and reverse primers are stable within this temperature range to anneal to each of the single stranded DNA template strands. The DNA polymerase is also stable enough to now bind to the primer DNA sequence. Extend DNA for 1 minute at 74°C: The Taq polymerase has an optimal temperature around 70-75°C so this step enables the DNA polymerase to synthesize and elongate the new target DNA strand accurately and rapidly. Repeat steps 2-5 25-30 times. Final Extension for 5 minutes at 74°C: A final extension to fill-in any protruding ends of the newly synthesized strands. Note: Primer3is an excellent resource for choosing primers. Note: If you are doing multiple PCR reactions, save time by creating a “master mix,” which minimizes the number of small volumes you need to pipet. If you are using the same template DNA for all your reactions, the Template DNA can be added to the master mix. Forward and Reverse Primers DO NOT get added to a master mix. Place reaction tubes in PCR machine. Set annealing temperature 5°C below the primer melting temperature (Tm). Set extension step at 1-2 minutes per kilobase of product depending on whether you are using a polymerase with proofreading capabilities. Note: See manufacturer’s instructions for specific instructions about extension time and temperatures. Initial Denaturation for 2 minutes at 94°C. Denature for 30 seconds at 94°C. Anneal primers for 30 seconds at 55°C (or 5°C below Tm). Extend DNA for 2 minutes at 74°C. Repeat steps 2-4 for 25-30 cycles. Final Extension for 5 minutes at 74°C. Run 2 μL on a gel to check size and concentration of PCR product. Multiply the volume of each reagent by the number of individual PCR reactions you wish to perform and add 10% extra to account for pipetting error. In this example, we have 7 different PCR reactions (7 unique primer pairs), so we multiply each volume by 7. Mix the contents by gently pipetting up and down several times. Keep tube on ice. Add the forward and reverse primers to the thinned walled PCR tubes. Note: Do this before adding the master mix so you know that the primers have been added, pipet the forward primer onto one side of the tube wall and the reverse primer onto the other. Add the master mix to the thin walled PCR tubes. Put 50µl – 2.5µl (fwd primer) – 2.5µl (rev primer) = 45µl volume of master mix to add to each PCR tube. Secure the tops to the PCR tubes, gently tap each tube to bring all the liquid to the bottom before placing it in the PCR machine. Most people order primers from a company, which synthesizes and ships them as a lyophilized powder. The researcher then needs to reconstitute their primers in liquid, normally sterile dH 2 O. To make a 100uM stock of any primer, add a number of µl of dH 2 O equal to the number of nanomoles of DNA times 10. For example, if your lyophilized DNA is 38.5nm, add 385µl of water. After making your 100uM stock, immediately make a working concentration of each primer (10uM) by making a 1:10 dilution of the stock. For example, add 100µl of primer stock to 900µl of dH 2 O. If your target DNA sequence is GC-rich, increase the time of the denaturing. Your 5’ and 3’ primers should be designed to have similar melting temperatures (Tm). Set the annealing temperature to 5°C lower than the Tm of your primers. If you are getting non-specific PCR products, increase the annealing temperature step-wise by 1-2°C. The rate of DNA synthesis is ~1-2 kb/min. The extension time can be adjusted according to the length of the target sequence. How do I design primers? See ourPCR cloning protocolfor more detailed instructions on primer design. What do I do if my PCR reaction isn't working? Try adding 1µl of 25mM MgCl2and/or 1µl DMSO to each reaction. The ideal setup for this troubleshooting step is to do one reaction with each, and one reaction with both. MgCl2acts to supplement the amount supplied by the buffer stock, where it is known to form a gradient when frozen. DMSO helps with denaturation of the DNA, particularly for GC-rich templates. What does each ingredient specifically do? Template DNA contains the portion of DNA that we are interested in amplifying for analysis and manipulation. It is essential that the template DNA and primer are complementary for a PCR reaction to work efficiently. Taq Buffer with MgCl2provides an optimal and stable chemical environment for the DNA polymerase to work adequately. Divalent cations such as Mg2+ and Mn2+ stabilize the buffer solution. These cations can also be used for PCR-mediated DNA mutagenesis. A higher cation concentration increases the error rate of the DNA polymerase. Deoxynucleoside Triphosphates (dNTPs) are the building blocks added one at a time to the new DNA strand by the DNA polymerase. Forward and Reverse Primers hybridize and are complementary to the 3’ ends of the sense and anti-sense strands of the template DNA. They are strands of nucleic acid that are starting points for DNA elongation and synthesis. Taq DNA polymerase is a special DNA polymerase that can withstand radical temperature changes during a typical PCR reaction. The DNA polymerase has an optimum temperature around 70°C and is the molecule responsible for driving the DNA synthesis. Sterile dH2O is used to fill the remaining 50 μL PCR reaction. Its solvent and buffer capabilities provide a suitable environment for the DNA amplification reaction.